Today's prompt is "You are my sunshine..." Jenny's prescribed word count this week is 50 additional words. With the advent of school, below you'll find a reminiscent ode to summer. You make me happy when skies are gray… "
Our young voices joined with Mom’s as we sang our way across state lines to family vacation paradise. What a memory! The songs change but the fellowship and fun continues—the legacy of summer. You'll be glad to know we still sing that song today...my kids, 7 and 9, love it! Good use of the prompt! Oh, your summer vacation is soon coming to a close with school on the way. Love those summer memories. This song can never go out of fashion, can it? Lovely! Such a positive and uplifting post! Nothing is so precious as our childhood memories, especially the ones when we were on the road. Lovely. lovely ... such happy summer memories! so, so true. to this day I will always remember one very fun trip as a child, and all the singing we did. My two dogs sang all the way from Tucson to the Georgia coast. I'm not sure, but it did sound somewhat like "You are my sunshine." I ndon't think the song will ever really die. I love summer memories...and the song is one my family sings too! 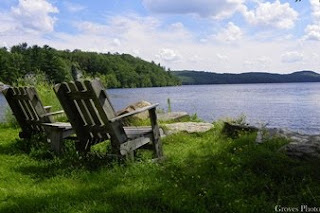 your pic looks like Blue Mountain Lake in the Central Adirondacks...I'm heading there on Wednesday. ONe month from today I will be back to the classroom with a new group of students and hopefully the same team of teachers/assistants!! Enjoy your last days of summer Laura! Love the nostalgia. Most of us share these types of memories. Yes, it's a lovely song that will probably survive. When my brother and I were children we use to sing in the car on summer vacation trips. It was so long and boring otherwise. But since I don't own a car right now, I can't offer my own children the same kind of summer recreation that I had myself as a child. I love summer, but even love spring more, where everything comes up fresh and new and you have the hopes and dreams that you know summer is coming! What a well written, happy memory. You are so blessed to have had that experience ! Road trips and singing in the car! I remember those days fondly. I can still get my 30 something kids to join in with certain songs if I start singing. This was a fun stop this week.